I will try to keep this post in-sync with Deathfly's post as much as I can, and cross-post releases. I will tag my releases with [Trylobot], and presumably Deathfly will tag his similarly. - Fixed bug #17 "Weapon Group changes in variant mode not saving." - Fixed bug #15 "Selected weapon slot not displayed during weapon group assignment (variant mode)"
- Also moved the weapon groups list to the left side of the screen, so that the selected weapon can be seen more easily. - Added a keyboard help entry in variant mode for toggling autofire with "A"
- Fix up the "Clear Data"(or say “Create New Data”?) function. - In ship edit mode it will no make the sprite display freeze anymore. - In variant edit mode it will now try to create an empty new variant called "New" for edit. - In weapon edit mode, it will create an new weapon file. 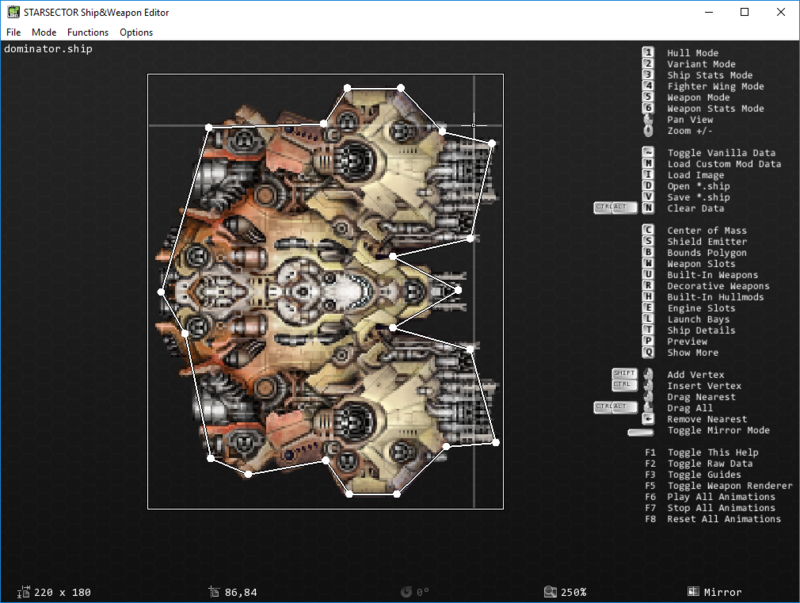 - Make editor resizable while running. - Add an "Unsaved changes warning" when you may discards your unsaved changes. - Will consider a serial string editing actions as one step due to it is too annoying to capture every keys. - Left Mouse Click now can only used for set center. - Ctrl + Left Mouse Click now can used to set radius without reset the center frist. - Ctrl + Left Mouse Click always add a new launch bay. - Hold down Shift will lock on the nearest launch bay. - Shift + Left Mouse Click will add a new launch port to the locked lauch bay. - Remove the Right Mouse Click function. - Ctrl + Left Mouse Click now will try to insert new bound vertex between the nearest bound segment ends. - Same as "Built-in Weapon Edit Mode", but for decorative weapons. - Can render all build-in and deco weapons in ship edit mode. And render all weapons in variant edit mode. - Hit "F5" can toggle weapon renderer from "render in 100% opacity", "render in 50% opacity", and "do not render". - Can use F6, F7, and F8 to Play, Stop and Reset all weapon animations, if there any. - Will properly parse and recode a .wpn file. - Will display weapon offsets properly. For hardpoint and turret, both. - Will display cursor coordinate properly. - Make the glow on weapon more closer to in game visual. - String editor for weapon now will provide accessibility to most weapon parameters. - Guides will mark the weapon's pivot point out. - Add SYNERGY and COMPOSITE weapon slots support. - Improve the performance for Preview All function. - Replace the default background with a less obscure one. - Add a filter that can fit out deco weapons when place weapon in non-deco slot. - Add "custom_bg_image" that can set path for using custom background. - Add "performance_mode", set to 1 can simplify some drawing process and result a better performance. - Add "fluxmod_limit_override", set to 1 can override the 10/20/30/50 max flux vants/caps limit in variant edit mode. - Add "scale_help_UI_scale_level". If it set to 0, help UI will auto zoom. - Add "custom_FONT" that can set path for custom font. - Add "UTF8_support", set to 1 to enable UTF-8 support, to decode UTF-8(without BOM) data file. - Add "localization_file" that can set path for LanguageDefinition file. - Make engine flames looks more close to in game visual. - Rework String data editing console. Make insert characters practical. - Rework all "item selector" to fit some way too looong item list. - Guides precision increase to 0.5. - Can safely remove weapon slots with built-in weapon in it. - Simplified help UI text drawing method for better performance. - Fixed a crash when try to remove a weapon slot/engine/launch bay while there isn't anyone. - When rename a weapons slot, the built-in weapon in that slot will got removed now. - Fixed a issue that the rjson core will mistakenly discard "0" for integer output. PRE-RELEASE: more bugfixes coming soon! this is HIGHLY RECOMMENDED to use over the STYLE SPEC per-engine. 'system id' as a string type so it won't try to graph it. the entities on-screen at once. No time for it today, however, but I'll get back to you on this. Confirmed to work on Windows XP. I do get a dialog with "EXCEPTION_ACCESS_VIOLATION" (and nothing else) on exit, but that's not exactly a big issue. Did I mention that this is awesome? Haha thanks for the feedback guys I had fun making it. Took ~1 day. BlitzMax is freaking awesome. Nice work! You're the best, Trylobot. Links, maybe somebody here have this tool and can upload it? Fear my 1337 Google skillz. But yeah, I have no idea if this even works anymore. Might be worth a try, though. Have fun. I must ask, Trylobot, do you plan to develop this utility any further? Even with its limited functionality, I use it over the other ship editor for one reason: precision. Being able to see the coordinates for any location by simply moving your mouse over it is extremely helpful, and allows new ships to be made with dead accuracy, rather than just eyeballing it. One feature that would really make it great would be the ability to add in weapon slots, and adjust their angles and arcs, specifically. Engine slots and other misc attributes can be easily copy-pasted in from another .ship file, so if you do plan to do any more work on this, I'd make these a low priority. Feel free to ask me if you need it to be tested.